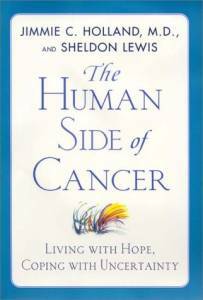 In her book, and the corresponding excerpts which appear here, she shares what she has learned from all of them about facing this life-threatening illness, and what truly helps along the journey. While the cancer experience includes the feelings of uncertainty and anxiety, her material inspires hope. Dr. Holland is a pioneer in the field of psycho-oncology, and her helpful guidance offers specific techniques for self-empowerment while dealing with the issues of diagnosis, treatment, and its aftermath. Doctor Holland is the Chief of Psychiatry and Behavioral Sciences, at Memorial Sloan Kettering Cancer Center in New York, and a professor of psychiatry at Cornell University Medical College. She has been awarded the American Cancer Society’s highest award, the Medal of Honor. She is a recipient of the Special Presidential Commendation for her contributions to psychiatry. Among her many activities and professional affiliations, she finds time to donate her expertise to the Oral Cancer Foundation as a member of our Science Advisory Board. The New England Journal of Medicine has said, “Dr. Jimmie Holland’s book so fully covers its subject matter that it is an experience in itself, providing the satisfaction that comes from discovering that nothing unimportant has been included, and nothing of importance has been left out.” If you are interested in reading her work in its entirety, this link will take you to her book on Amazon.com where it may be purchased.